Our newest printer is the very compact Epson Stylus Pro 3880. It uses the Epson’s Ultrachrome K3 plus Vivid Magenta Ink set. 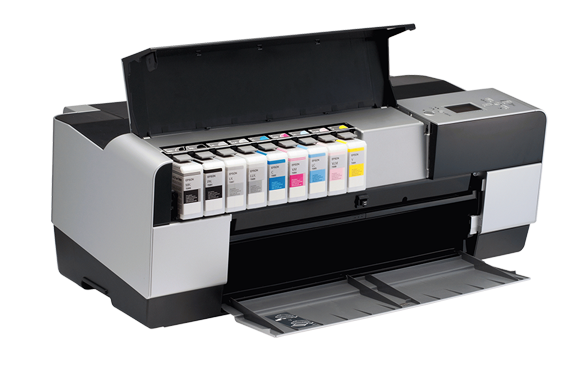 The 3880 was purchased so that AaI&A staff can supplement what our members send us in the way of numerous K3VM ink/paper/coating combinations for testing purposes, and it will also serve as a great little pigment printer for teaching purposes. I’ve started to teach digital printing at a local art school here in the Berkshires. The 3800 is portable (just) enough to drag to classes, yet with its 17 inch wide carriage, big enough to make some impressively large prints. The jump from a 13 inch desktop printer to a 17 inch desktop printer may not sound all that significant, but it really is when students start working with 17×22 cut sheet boxes of inkjet paper rather than the more ubiquitous letter-size and 13×19 Super B sheet sizes. Note: I will update this news article soon with photos of the unpacking and setup plus first impressions, but with other projects concurrently running including new behind-the-scenes website programming and soon-to-be-posted test reports, this news item will have to appear in stages. Keep an eye on it if you are interested in my first impressions of the 3880.